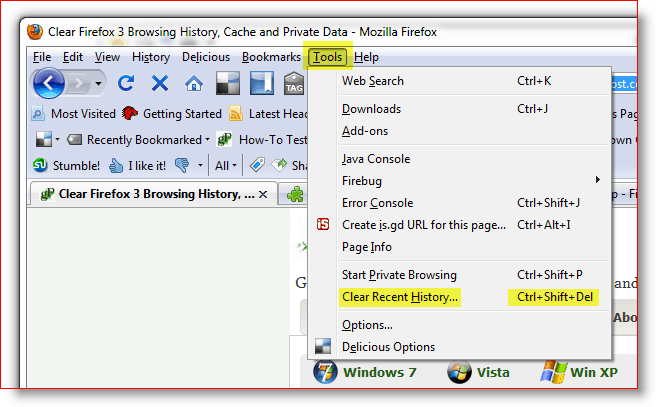 One of our most popular articles on groovyPost.com is How To Clear the Firefox History and Cache and How To Clear Firefox History, Cookies and Cache Automatically at Exit. Since then a lot has happened in the land of Firefox. Specifically, the User Interface for clearing the cache has changed, a new Private Browsing Mode is introduced, AND there are now several add-on tools which have been created to help you through the process of clearing your history, cache, and cookies. Let’s dive into each of these new areas! Open Firefox and hit the ALT button to open the File Menu. Then click Tools, Start Private Browsing. You can also just use the Keyboard Shortcut Keys Ctrl+Shift+P. 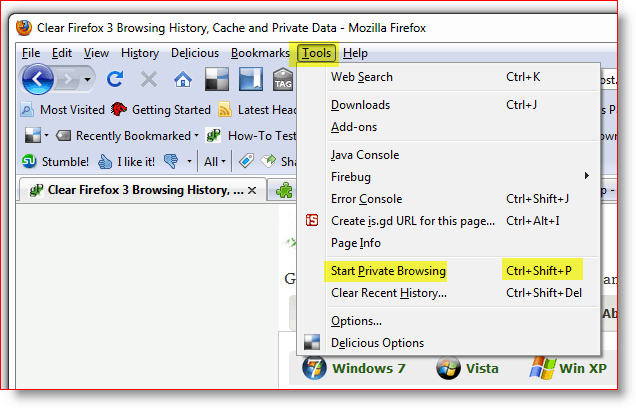 Once you enable Private Browsing, don’t be surprised when all your other Firefox windows and tabs close. This closing is by design. Once you close the “Private Browsing” Firefox window and re-launch Firefox again regularly, all your previous windows and tabs will open. Now that we have that out-of-the-way let’s show you the NEW way to manually clear the Firefox History, Cache, and Cookies vs. the old method. Firefox. The first thing you will notice is a new Drop Down menu based on a Time Range. You can either just leave the default which is EVERYTHING or adjust the dropdown to only include the Last Hour, Two Hours, Four Hours or Entire Day. Pretty groovy. Click the Down Arrow to specify the Time Range you want to clear the history for, and then Check the boxes to clear each of the categories of data that you want to clear. Most will want to clear their Cookies and Cache etc. Either way, Click Clear Now to start the wipe. 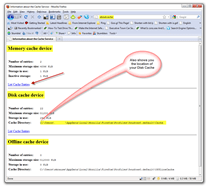 Did you know you can just type About:Cache into the URL bar of Firefox and get a breakout of your Cache? Click the screenshot to the right to get a quick idea of what I mean. Very groovy little tip if you are paranoid and want to make sure you nuke all your cache! 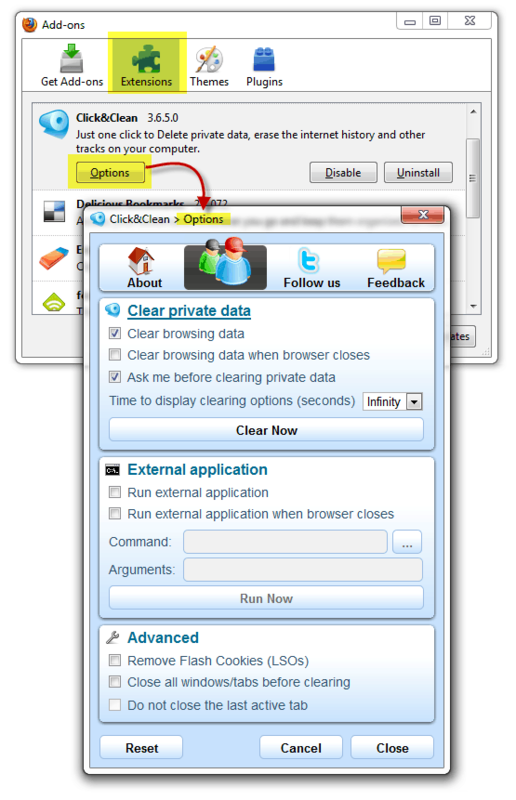 In the previous article, I also talked about How-To automatically clear the private data when you close Firefox. Since I wrote that article, the screens have changed, as well as some other options, so let’s take a look at all of them. 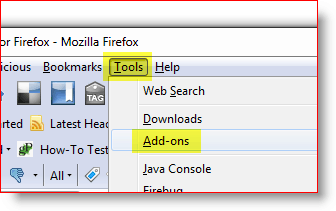 Open Firefox, hit the ALT key and Click Tools, Options. 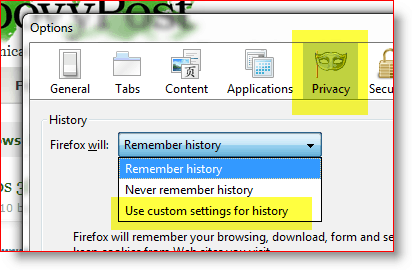 Click Privacy Tab then Click Down Arrow in History Box and Click Use custom settings for history. Configuring them both are as straightforward as a checkbox once you find where you set it. Good news for you, now you know! Decide which options you want to enable and check the boxes. If you enable the Clear checkbox history when Firefox closes, then be sure to Click Settings to customize what will automatically clear when you close Firefox. So now that you understand the bowels of clearing your private data from Firefox, you won’t feel guilty using an Add-on that makes the job a little easier. After all, one thing that makes Firefox so attractive is the large user community who are always building new add-on tools for it. 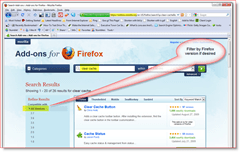 The first step to finding the tool we need is just to go to the Firefox Add-on site and search for something like clear cache. You can filter the results to your version of Firefox. However, the site also does an excellent job of detecting your version of Firefox and not giving you a Download prompt if the Add-on isn’t compatible with your version of Firefox. I tried out 2 or 3 add-on tools for clearing the cache and overall they were fine. Cache Status – Adds a nice status to the bottom right of Firefox that shows you your memory and disk cache status. Right-click the status bar to Clear the cache. The downside is this will only clear the cache, not the cookies. 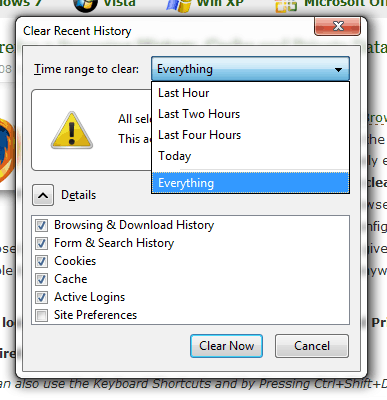 Click&Clean – Probably the best of the 3, allows the most options plus the option to clear Flash Cookies. However, it is just an Icon that does the same thing as Ctrl+Shift+Del. Empty Cache Button – This probably would have been my favorite. However, the Options didn’t expose to me the option to let me configure it to clear Cookies + Standard Cache. 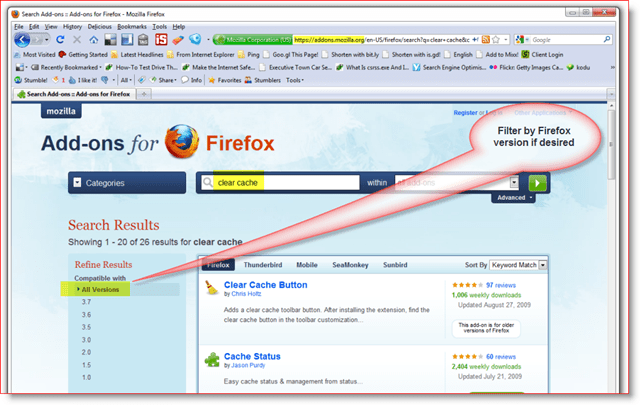 So now that you have one of the Firefox Tools installed to clear your cache, how do you configure them? Simple. Hit the Alt key and Click Tools, Add-ons. 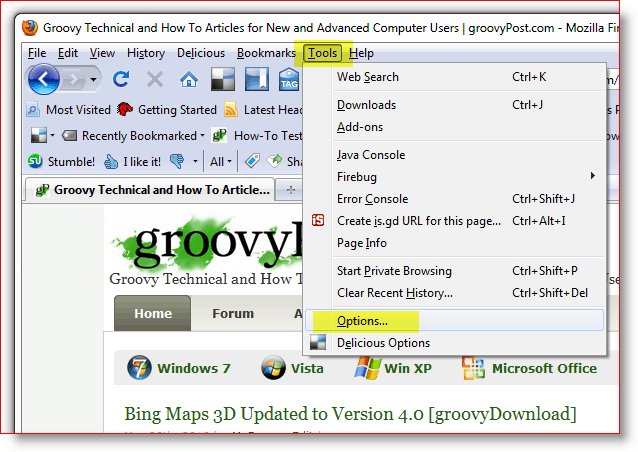 Click the Add-On you wish to configure and Click Options. Note: Some configurations for each add-on application is unique so that the options will vary widely. Some Firefox add-ons don’t even let you configure them, so just an FYI. So now that you’ve installed the Add-On where is it? 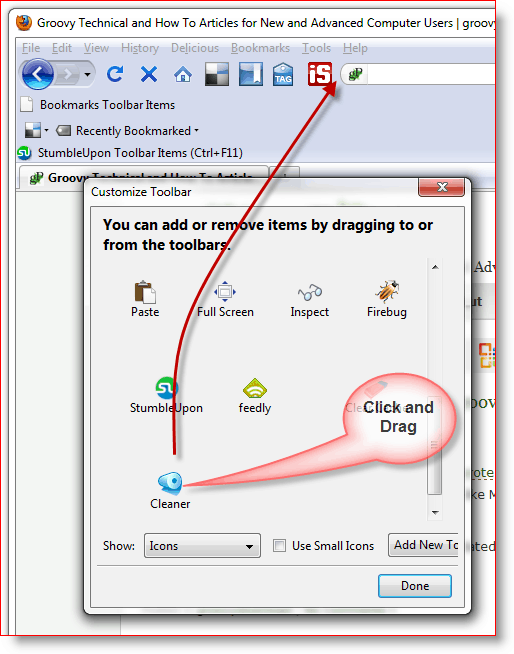 Oh yeah, before you can use some add-ons you need to add the Icon to your Toolbar. Personally, I like to add the Clear Cache Icon next to my URL Bar. Here’s how you do that. 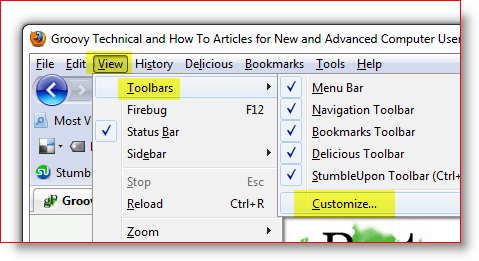 Open Firefox, Hit the Alt key and click View, Toolbars, Customize. Find the Icon for the new Add-On, Click and Drag it to where you want it to live. Click Done after you move it. Here’s what it should look like when done. So, as I said earlier, this tutorial was created using Firefox 3.6.2 as were all the screenshots, etc. Being that this is technology, there is no question that things will change, so be sure to subscribe to groovyPost.com to receive all the latest updates in Firefox privacy/security. Comments? Did I miss your favorite tool, Firefox tip or did confuse you? Join the discussion and drop a comment below.